Domenico Bongiovanni obtained his Bachelor and Master degrees in Electronics Engineering at the University of Palermo (Italy), defending a thesis entitled “Silicon Photomultiplier Circuit Model.” His thesis work was focused on developing an electrical circuit model for a silicon photomultiplier, used in nuclear physics. This work was carried out during an internship of two years at the Sensor Design Group of the STMicroelectronics of Catania. In September 2011, he moved to Canada to do his PhD student at l’Institut National de Recherche Scientifique – Énergie, Matériaux et Télécommunications (INRS-EMT), under the supervision of Prof. R. Morandotti. His PhD research work aimed at investigating the propagation of self-accelerating wave packets into linear and nonlinear media. In 2017, he was a visiting researcher at the Nankai University in China where he carried out experiments in shock waves. 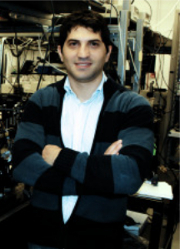 Since June 2018, he has enrolled at the INRS as a postdoctoral fellow. Bourses d’ Excellence exemption de Plasma-Québec, Montreal (QC) Canada ,2012, (CAD$ 5000). Bourses d’Exemption des Frais Majorés pour les Étudiants Étrangers de l’INRS , Varennes (QC) Canada , 2010,(CAD$ 33000). “Tableau d’honneur du vice-recteur à la recherche et aux affaires académiques”, Collation des grades INRS, Québec city (QC) Canada 2018. Domenico Bongiovanni, Benjamin Wetzel, Yi Hu, Pengzhen Yang, Yujie Qiu, Jingjun Xu, Stefan Wabnitz, Zhigang Chen and Roberto Morandotti,“ Demonstration of Spatial Riemann Waves and Inviscid Burgers’Equation Dynamics in Nonlinear Optics”, in preparation to be submitted to Optics Express (2018). Domenico Bongiovanni, Benjamin Wetzel, Yi Hu, Zhigang Chen and Roberto Morandotti, “Optimal compression and energy confinement of optical Airy bullets”, Opt. Express 24(23), 26454 (2016). Benjamin Wetzel, Domenico Bongiovanni, Michael Kues, Yi Hu, John Michael Dudley, Stefen Wabnitz, Zhigang Chen and Roberto Morandotti, “Experimental Generation of Riemann Waves in Optics: A Route to Shock Wave Control”, Phys. Rev. Lett. 117(7), 073902 (2016). Domenico Bongiovanni, Yi Hu, Benjamin Wetzel, Raul Amaury Robles, Gregorio Mendoza González, Erwin Armando Marti-Panameño, Zhigang Chen and Roberto Morandotti, “Efficient optical energy harvesting in self-accelerating beams”, Sci. Rep. 5, 13197 (2015). Yi Hu, Domenico Bongiovanni, Zhigang Chen and Roberto Morandotti, “Multipath multicomponent self-accelerating beams through spectrum-engineered position mapping”, Phys. Rev. A 88(4), 043809 (2013). Yi Hu, Domenico Bongiovanni, Zhigang Chen and Roberto Morandotti, “Periodic self-accelerating beams by combined phase and amplitude modulation in Fourier space”, Opt. Lett. 38(17), 3387-3389 (2013). Yi Hu, Ming Li, Domenico Bongiovanni, Matteo Clerici, Jianping Yao, Zhigang Chen, José Azaña and Roberto Morandotti “Spectrum to distance mapping via nonlinear Airy pulses”, Opt. Lett. 38(3), 380-382 (2013). Yi Hu, Zhe Sun, Domenico Bongiovanni, Daohong Song, Zhuoyi Ye, Cibo Lou, Jingjun Xu, Zhigang Chen, and Roberto Morandotti, “Reshaping the trajectory and spectrum of nonlinear Airy beams”, Opt. Lett. 37(15), 3201-3203 (2012). Giovanni Condorelli, Delfo Sanfilippo, Giuseppina Valvo, Massimo Mazzillo, Domenico Bongiovanni, Angelo Piana, Beatrice Carbone, Giorgio Fallica, “Extensive electrical model of large area silicon photomultipliers”, Nucl. Instrum. Meth. A 654, 127-134 (2011).